Dumbotz is a show about a trio of outdated robots, but they don’t know they are! 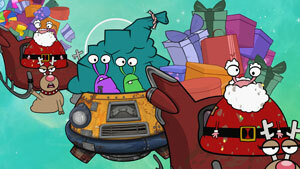 See what happens when Attack of the Slug Santas airs on 16th December, 5.30pm on NineGo. Beyond West is partnering with the Western Australian Football Commission to present a sneak preview of its new Aussie Rules series at Subiaco Oval. Beat Bugs has won the Best Animation Program or Series at the 2017 Leo awards held on 4th of June. Filming starts for "A Team of Champions"
Beyond West’s latest production “A Team of Champions” has begun filming in WA. Beat Bugs writers Josh Wakely, Cleon Prineas and Joshua Mapleston have won the 44th Annual Daytime Creative Arts Emmy for Outstanding Writing in a Preschool Animated Program. Another nomination for Beat Bugs! The hugely popular Beat Bugs animated series has been nominated for a TV WEEK Logie for Most Outstanding Children's Program. Beat Bugs has been nominated in five Daytime Emmy categories! Beat Bugs, the children’s animated series, won the Best Children’s series in the TV awards presented on 5th December by the Australian Academy of Cinema and Television Arts (AACTA).